Genesis 21: It’s A Boy! Sometimes I read one of these chapters and I know exactly what I am going to write about it. I am finding that this happens when the chapters themselves are focused on one topic. Other times I finish reading and wonder how in the world I will be able to make any kind of coherent thought. This usually happens in chapters like Genesis 21. Let’s see what happens! Isaac is born! Hooray! Bust out the cigars and hang up the balloons! (I just ended five sentences in a row with exclamation points) God has come through on his promises. Back in chapter 17 and 18, Abraham and Sarah were laughing because God’s promise seemed so ridiculous. Now they are laughing for joy at the fulfillment of those promises. And the laughter is contagious. I love that the joy of Isaac can spread to anyone who hears Sarah laughing. Who doesn’t love infectious laughter? That is one of my favorite feelings. And this time, God is the source of the joy. Love it! Welcome to the world Isaac. You are the child of the promise. Then there is this whole depressing but slightly hopeful part with Hagar and Ishmael and the wilderness and God and hope and wells and I just am having so much fun with the laughing and with what comes next that I can’t bring myself to write about it right now or end this sentence or even have the decency to put in a comma. “Well of water” has now been mentioned twice in one chapter. Both of them are at “Beer-Sheba.”The first mention is a well that God provides for Hagar. The next mention is one that Abraham claims to have dug. It is noteworthy that we never actually see him do this. Abraham and Abimelech have a conversation where Abimelech explicitly tells Abraham to deal honestly with him. Remember, Abraham has had some trouble with this in the past. Abraham goes to great lengths to try to prove the well is his. But again, we never see him actually dig it. Conclusion: That well wasn’t haunted! It was just totally swindled by Old Man Abraham! Nailed it! 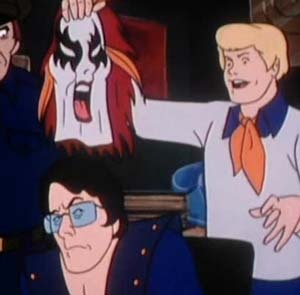 And I would have gotten away with it too! If it wasn"t for you meddling kids! Well, that actually didn’t turn out half-bad! I am just as surprised as you are that Scooby-Doo reference made it into this post.